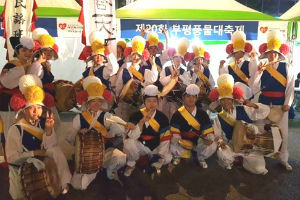 We are a traditional percussion band from Korea, and the name is HAN-UI. We belong to Natural Science College of Inha University. Samul-nori means playing four instruments: jang-gu, buk, jing and kkwaeg-gwa-ri. And using these intruments we make beautiful sounds.